"Il Focusing e la Teoria Ponte" is the first Italian book which makes the difference within the Italian Panorama about Focusing as a methodology to be used in businesses, professional activities and sport fields. The book showcases histories and experiences, maintaining the intellectual leadership of creativity, renewed start ups, mediation processes, and careful listening abilities. 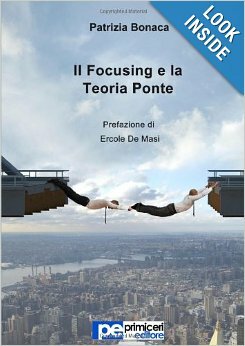 "Il Focusing e la Teoria Ponte" presents for the first time the author's methodology -named "Teoria Ponte" - which was developed to enable professionals to build a "bridge." The introduction is by Prof. Ercole de Masi - Primiceri Editore, author Dr. Patrizia Bonaca.